Also, I swear I didn't pay her to say that you should immediately drop everything to read David Mitchell's Black Swan Green but because it's Raych, you should do what she says. Now. What are you currently reading? Jose Saramago’s The Double. Where are you reading it? ON THE DECK IN THE SUNSHINE in an teeny bikini, but I have an irrational fear of being turned into internet pr0n, so alls you get is my sheet-toga. What do you think of it so far? Remember how you saw The Ring and then burned all the VCRs in your house so that you wouldn’t die, only to realize that you needed them to watch The Jungle Book because Disney hadn’t released the DVD from the vault yet, and so you bought a new one? You will burn that VCR again. What is the one book you love so much that you can’t be objective about other people not loving it as well? Have disagreements ever come to blows? The Chronicles of Narnia. If I ever meet Philip Pullman I will make out with him for having written His Dark Materials and then I will punch him dead in the face for the things he’s said about Narnia. THE ABYSS GAZES INTO YOU!!! Sleep lightly, kids. Do you generally borrow books or buy them? Why? I borrow. We are both students with no gainful employment on the horizon. Also, we move every six months or so, and for every box of books he has to carry to the van, I think my husband loves me a little bit less. Favourite childhood book? Narnia (see above). Also, Blueberries for Sal. Who is your literary boyfriend or girlfriend? (They need not still be living, or they can be a character in a book.) This list would overwhelm the interview. Let’s say Mr Rochester and Jamie Fraser to cover both the dark-and-brooding and roguish-but-still-gallant bases. Also, there are many people in the bloggonets whose babies I would willingly have. What is your favourite either unknown or underappreciated book? If you have not read David Mitchell’s Black Swan Green you need to stop doing whatever else it is that you are doing and do this thing. I’m not a bit of joking, do it now. Also, if you were not aware that The Princess Bride is a book as well as a movie, you owe me your first-born child for having apprised you of the fact. What book would a prospective lover/marriage partner/friend have to say they loved for you to end your relationship with them immediately? My taller half loves almost indiscriminately books that I hate, including The Da Vinci Code and Grisham’s The Innocent Man, but he is also ridiculously good-looking and can cook a frozen pizza better than anyone I know, so I think I’ll keep him. 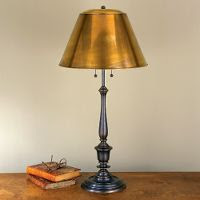 If you're interested in being featured on The Reading Lamp, just drop me a line at colleen at bookphilia dot com! Okay, someone else told me recently to drop everything and read Black Swan Green! I can't remember who it was, but two people in such a short amount of time surely means I should listen! Okay, I'll do it. EVERYONE: DROP EVERYTHING AND READ DAVID MITCHELL, STAT!!! I can't drop my laptop. Is it O.K. if I gently put it aside? Omg Jamie Fraser. He's sooo mine. I'm glad you disabused me of any idea to read American Wife, which has half caught my eye. Your comments made me laugh.